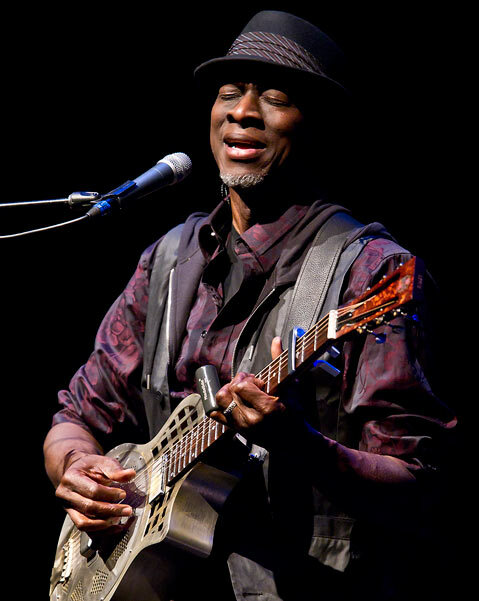 This was billed as a Spirit of the Holidays evening with Keb’ Mo’, and it turned out to be not only that, but also much more from this artist who’s developed substantially in recent years. Once primarily identified with the popularization of the Delta blues tradition, Mo’ has grown into an expansive version of a soul-singing rhythm-and-blues artist. And, while he’s still capable of laying down a mean beat all by himself, typically on a steel-fronted acoustic guitar, Mo’ surprised a lot of people on this particular evening with the way he led his excellent band, with powerful vocals complemented by great guitar playing on a red Stratocaster. The band, which included Jeff Paris on guitar, mandolin, and vocals, Les Falconer on drums, Vail Johnson on bass, Michael B. Hicks on keyboards and vocals, and Kevin So, also on keyboards and vocals, was versatile and funky, capable of moving easily from a Meters-style New Orleans backbeat to slinky, organ-and-guitar-driven electric blues reminiscent of The Allman Brothers Band in its prime. Mo’s songwriting covered a lot of ground, as well, with the biting satire of blues number “Government Cheese” leavened such heartfelt laments as his beautiful, recently-penned country song “We Don’t Need It.” In fact, “We Don’t Need It,” off of Mo’s newest album, The Reflection, may be the best song yet written about the new economic realities we all face because of the current recession.